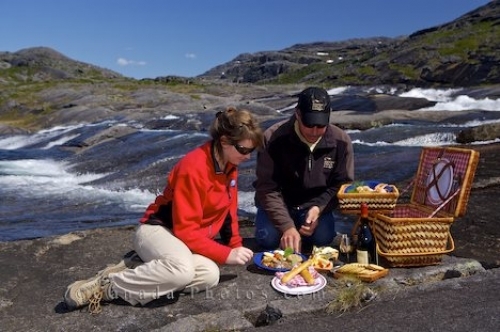 The sound of a waterfall flowing down the Mealy Mountains in Southern Labrador, Canada is one of the only noises heard by these people enjoying a picnic lunch atop the large boulders. This is a well packed picnic basket filled with meats, cheeses, crackers, bread, wine and all the utensils needed for a filling lunch. The scenery of the Mealy Mountains is spectacular as waterfalls rush over the rocky landscape and wildlife calls echo across the peaks. Reaching heights of more than 1 kilometer, the Mealy Mountains are made up of arctic tundra surrounded by boreal forests, waterfalls, rivers, lakes, bogs, fens and is a place many species of wildlife call home. To reach this destination, a helicopter tour will take you over the Mealy Mountains to see the landscape from above, but special requests are required to land and enjoy a picnic surrounded by the waterfall and wilderness of the Mealy Mountains. This is a unique experience and one which will not be forgotten while visiting Southern Labrador in Canada. Picture of a couple enjoying a picnic lunch atop the Mealy Mountains in Southern Labrador, Canada where a waterfall rushes by. A couple enjoying a picnic beside a waterfall with a Helicopter in the background in the Mealy Mountains, Southern Labrador, Labrador, Newfoundland Labrador, Canada. Model Released.